Ideally, we would all get our nutrients from foods. However, with food intolerances, food aversions, soil depletion, lack of access to high quality food sources, and food processing, some argue that this just isn’t possible in today’s world. I won’t argue either way. All I know is that doctors like it when women who are trying to conceive, pregnant, or nursing take a prenatal vitamin, but they aren’t always helpful in recommending one or up to date on the latest nutrient information. Anyhow, after the last few folic acid/folate posts, I received a few questions and comments about choosing a supplement for pregnancy. So I put my fingers to the keyboard and was reminded of what I already knew from my search many months ago for myself at the beginning of our surprise pregnancy. Choosing a prenatal vitamin supplement is a real bear. A real maze. A twisted, contorted game. If you read my recent posts on folic acid versus folate, you probably think that it’s probably high time to ditch folic acid in favor of a natural folate in prenatal vitamins (and vitamins in general). Great. Now you know. Now I know. But what good is knowledge if you don’t know how to act on it in real life? I tried to pinpoint a good prenatal vitamin with L-methylfolate for myself to take many months ago, but it wasn’t as easy as that. Let me say it again. It was not as easy as that. If I liked the vitamin content profile, then I didn’t like the extra ingredients, for example the use of soy, oats, artificial colors, or vanillin (an artificial vanilla flavor). If I liked the clean ingredient profile, it didn’t meet the minimum recommended iodine requirements. Or it didn’t have any DHA. Or it used ergocalciferol (a plant-based vitamin D) rather than cholecalciferol (the better utilized animal based). Or the vitamin B 12 was not the methylcobalamin form. Or it didn’t have any vitamin K2. What do you do? You do the best you can. You choose the best you can. (And you make EVERY BITE COUNT. More on my personal experience with that in a subsequent post.) There is no perfect prenatal out there. There just isn’t. I’ll tell you what I looked for. But this is the story of my thoughts and learning. Not my medical advice. Please don’t use my blog posts as medical advice. You’ll have to figure out for yourself with your practitioner’s help what you need for sure and also where you’re willing to compromise on your prenatal vitamin. Does it use folate or folic acid? I prefer L-methylfolate or another biological folate. Does it have the recommended dose of iodine? What is the source of iodine? I prefer it to have iodine since my iodine sources are limited (I don’t tolerate eggs and dairy well.) and haven’t yet sorted through which source I feel is best for iodine. Does it have selenium to accompany the iodine? If iodine is taken, then selenium needs to be sufficient as well. Is the vitamin D source from ergocalciferol (vitamin D2) or cholecalciferol (vitamin D3)? I prefer vitamin D3 (cholecalciferol). Does it have any vitamin K2 in it? Vitamin K2 is difficult to consume from foods, especially on a dairy-free diet, yet it is very important for health and fetal development. Many supplements lack this. Does it have the methylated form of vitamin B12 (methylcobalamin)? I prefer this. Does it have any DHA? (A type of omega-3) None of the prenatals I looked at contained DHA. I made a point to eat DHA-rich foods, and if that wasn’t happening, I supplemented. What extra ingredients does it have? I don’t see any reason for artificial colors and artificial flavors (like vanillin). In addition, I am always on the lookout for soy, dairy, and gluten in any supplements due to some sensitivities. I scan ingredients, also, for added probiotics or FOSs which may not agree with tummy issues. What are the amounts and types of other minerals, like iron, calcium, and magnesium? Many prenatals don’t have the recommended allowances of these, which can be okay. However, women need to make sure they know how much of these minerals are in their prenatal vitamins so they can get their needs elsewhere if required. Some women rely on their vitamins because of food aversions and nausea. What is the vitamin A source and how much is in there? Striking a middle ground here would probably be wise. Not too much. Not too little. If you eat a lot of vitamin A rich foods, lean on the lower end in the supplement. How many pills need to be taken? Sure. One is ideal but probably not optimal for absorption and maximizing nutrients. For example, the calcium needs of the body cannot be absorbed in one sitting. It needs to be spread out through the day. Initially, I took a vitamin B complex with an active form of L-methylfolate made by Designs for Health along with some fermented cod liver oil since we were in the dead of a brutal winter (which would provide vitamin D, vitamin A, and DHA/EPA). Then, I switched to a Designs for Health multi-vitamin that I already had in my cupboard which would provide some vitamin K2, iodine, zinc, biotin, and choline for baby and me, but it recommended 6 pills per day! Right. I was not very compliant with that. So I eventually picked up a pre-natal from the local health food store, Rainbow Light, and made do with it, but it did not meet all my criteria. My nutrition overall was strong and well thought out, and I felt the prenatal was more of a safety blanket for me. Like perhaps to cover my low intake of iodine until I recognized a weak area in my diet. I went back this week and looked at some prenatal vitamins after reading up on folic acid/folate, and I wished I had had the energy to investigate them all early in that first trimester. But I didn’t. So here are some of the vitamins I looked at this week that met a lot of criteria I find important. I also listed Rainbow Light since I took it and saw a lot of women commenters on other sites mention it. Do not use this list as a recommendation list. Use it as a place to start looking, comparing, and contrasting which vitamin might fit you best, and always enlist the help of your physician to make sure you’re not overlooking something. 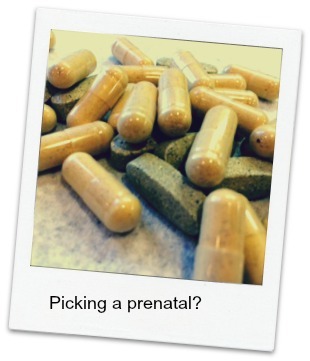 This is not the prenatal from the same company. The prenatal has folic acid, not folate. This has Metafolin (L-5-MTHF), vitamin D3, iodine, selenium, methylcobalamin, and biotin. The dose is 4-6 capsules. With the recommended dose, one does not reach the recommended doses of calcium and magnesium. A bonus of this brand is that there are different tweaks available, like no iodine or no iron for example, for those people who have health issues necessitating avoiding these. This has L-5-methyl tetrahydrofolate (L-5-MTHF), vitamin D3, iodine (although a lower amount), selenium, methylcobalamin, and biotin. The dose is 4 capsules. With the recommended dose, one does not obtain the recommended daily doses of magnesium and calcium. The ingredient list should be inspected for a person to see if there are any sensitivities to included ingredients, like quinoa and FOS. One source of vitamin A is vitamin A palmitate, rather than simply relying on beta-carotene. A reader may want to research this a bit. Especially if they eat many food sources of vitamin A. This has calcium folinate and L-5-methyltetrahydrofolate (L-5-MTHF), both biological folates. It also uses vitamin D3, iodine, selenium, methylcobalimin, and biotin. There is no vitamin K2. Calcium and magnesium do not reach the recommended daily doses. The source of vitamin A is also palmitate (and carotenes). The dose is 3 capsules. Designs for Health Complete Multi has vitamin D3 (cholecalciferol), vitamin K2, natural folates (5-MTHF and 5-FTHF), methylcobalamin, biotin, choline, iodine, and selenium. The calcium and magnesium are less than recommended allowances. There is NO iron and no copper. Its vitamin A source is carotenoids. The dose is 6 capsules. This vitamin is out of stock reportedly due to popularity, but there is a protein powder designed to be interchangeable. They are working to get the vitamin back in stock. The folates are natural folates (L-5-methylfolate and folinic acid). It has vitamin D3 (cholecalciferol), vitamin K2 (menaquinone-7), methylated forms of vitamin B12, biotin, choline, iodine, and selenium. The calcium and magnesium are less than the recommended doses. The dose is 8 capsules. Its vitamin A source is partly beta-carotene and partly palmitate. Rainbow Light is a food-based multivitamin, vegan compliant. It is what I landed on for a prenatal vitamin due to chance, and it gets good reviews on-line. It misses some of my criteria. I landed on it, but I don’t think it’s the best. It’s vitamin D source is D2 (ergocalciferol). It has no vitamin K2. It does not have the methylated form of vitamin B12. On the other hand, it does have iodine, choline, and biotin. It also contains iron. The calcium and magnesium content, like the other brands, is less than the recommended daily doses. It has some added ingredients, like red raspberry leaf, ginger, spirulina, probiotics, and digestive enzymes for readers to investigate. I think this is a good list of prenatal vitamins/multi-vitamins to start to check out. Do readers have any others (and thanks to those who gave suggestions)? Remember, it’s all a game of checks and balances. Start with a good, strong, well-planned pregnancy diet and make sure your supplement does that–supplements the gaps in your diet. Run all of your supplements by your doctor. All the best to you for a happy, healthy family! This entry was posted in Pregnancy and tagged choosing a prenatal vitamin, folate, folic acid, paleo, prenatal vitamin, primal, whole foods on August 12, 2014 by thehomeschoolingdoctor.